There are real problems and there is nonsense manufactured to keep our minds off the real problems. A real — and immediate — problem is the fact that Iran’s wholly-owned subsidiaries Syria and Hezbollah have tens of thousands of missiles, short, medium, and long range, all aimed at Israel. Another real problem, although slightly less immediate, is that Iran is moving along on her nuclear weapons program. In the category of nonsense, Condoleezza Rice has said that “Young Palestinians are losing hope for an agreement with Israel”. Losing hope? Were there ever “young Palestinians” (or even old Palestinians) pining away for a deal between Israel and the US-armed, Western-financed Fatah faction that they don’t support? 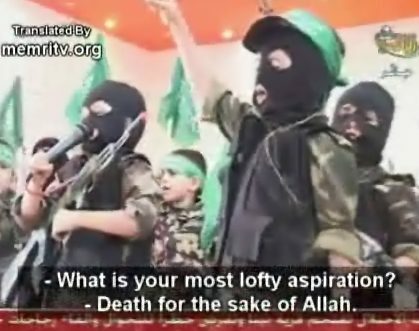 A public opinion poll [March 2008] reveals that an overwhelming majority of Palestinians – 84 percent – support the shooting attack at the Marcaz HaRav yeshiva on March 6 that left eight Jewish boys dead. The most recent Israeli and Palestinian public opinion poll conducted jointly by the Harry S. Truman Research Institute for the Advancement of Peace at the Hebrew University of Jerusalem and the Palestinian Center for Policy and Survey Research in Ramallah, describes Palestinians’ ‘staggering’ support of violent acts against Israel. Support for the shooting attack was greater in the Gaza Strip – at 91 percent, compared to the West Bank at 79 percent. A further 64 percent of Palestinians polled support launching rockets from the Gaza Strip into Israeli towns, such as Sderot and Ashkelon. The idea that Palestinians want a state in the territories is a wish-fulfillment fantasy of the Israeli Left and a useful fiction for the US State Department. The ongoing negotiations between Mahmoud Abbas’ Fatah faction and Israel, in which Abbas continues to insist on impossible conditions (like 1967 borders and a right of return for descendants of 1948 refugees), and which Israel pretends to take seriously, are manufactured nonsense. What almost all Palestinians, young and old, hope for is the collapse of the state of Israel, brought about by a combination of their ‘armed struggle’, regional war with Syria and Hezbollah, and diplomatic pressure from the oil-addicted and — at least in the case of the US — Saudi-subverted West. I wanted to ask Ms. Glick how she understood the first of these statements, in the light of the continued complaints by Condoleezza Rice that Israel is “violating the road map” by constructing new homes inside existing settlements such as Elkana and in Jewish neighborhoods of East Jerusalem, places which certainly count as ‘Israeli population centers’ which would remain in Israel in any reasonable final agreement. And I wanted to ask why, considering the second statement, the US insists that ‘everything is on the table’ for negotiations, including the unacceptable and absurd demand for a right of return for millions of descendants of Palestinian refugees, something that is equivalent to ending the Jewish state. I have written about this contradiction before (see “Annapolis is an irrelevant joke“), but I remained profoundly mystified by my own government’s schizophrenia with respect to its ‘valued ally’, Israel. According to last Thursday’s Washington Post, Bush administration officials are doing everything they can to try to get out of the President’s commitment to Sharon. Justifying the letter as an insincere piece of political maneuvering used to help Sharon expel the Jews from Gaza and Northern Samaria in 2005, they explain that the letter is no longer politically necessary. It served its purpose of drumming up domestic Israeli support for the now completed withdrawal and expulsion and ought to be set aside. So there’s nothing to be mystified about. Bush wrote the letter to help smooth the path to Israel’s withdrawal from Gaza, and now that that is done it has become ‘inoperative’. The Washington Post, by the way, consistently refers to ‘settlement expansion’, but in fact the boundaries of the ‘settlements’ and neighborhoods in question are not being expanded; homes are being constructed within them. There is apparently a disagreement between the US and Israel about unpublicized understandings of what constitutes ‘good’ and ‘bad’ settlement construction. The US claims there are no such understandings, and that any construction outside of 1967 borders is a problem. Israel says that there is an understanding that unsubsidized construction can continue within settlements and neighborhoods that are expected to become part of Israel. But if the Bush letter has any significance, it certainly must imply that what Israel does within the boundaries of Elkana, for example, is none of our business. If it doesn’t mean at least that, then what does it mean? What exactly is it that President Bush “stands by” in the letter? Present State Department positions seem to be indistinguishable from those of Mahmoud Abbas, who continues to insist on 1967 borders and a right of return. If Hadley’s remarks are taken seriously, the word of the President of the United States is no better than that of Yasser Arafat, who lied about recognizing Israel and renouncing terrorism in order to get his foot in the door when he signed the Oslo Accord. Jerusalem Post columnist and author Caroline Glick spoke here in Fresno yesterday. Her talk was well attended, but as often happens, many of those who most needed to hear what she had to say were not present. The Israeli-Palestinian conflict, so often called ‘the root of the problem’ in the Middle East, is in fact a sideshow, one of the proxy wars spun off from the real root, the war that Iran has been fighting against the United States — the Great Satan — since 1979. Glick sees Iran as a ‘revolutionary state’, like the Soviet Union and the US, which has a policy goal of exporting their revolution (communist, in the case of the Soviets, democratic in the case of the US, and Islamic for Iran). Iran, in her view, sees the US as the major obstacle to achieving this goal, and to that end has supported proxy wars and terrorist actions around the world by Hizbullah, which she calls “the Iranian Revolutionary Guard’s Foreign Legion”. The war in Iraq has become a proxy war, with the US primarily fighting Iranian-supported insurgents, both Shiite and Sunni. Iran apparently does not shrink at cooperation with Sunni groups such as Hamas and Al-Qaeda, at least insofar as they attack American interests. Iran sees Israel as her immediate target for multiple reasons. For one thing, Israel represents an outpost of American power in the Mideast, and is standing in the way of the projection of the Iranian revolution into the Eastern Mediterranean area — not just Israel, but Lebanon, Jordan and even Egypt. For another, the presence of a Jewish state in the heart of Dar al Islam is a bone in the throat of all Islamic fundamentalists, and whoever removes it will have a real claim to leadership in the Muslim world. Israel, the “Little Satan”, is directly in the crosshairs of the huge military machine that Iran has built with its windfall oil revenues. Iran, Glick said, has spent literally billions building up Syrian non-conventional military capability: a massive number of rockets and artillery pieces, many armed with chemical warheads, aimed at all parts of Israel. Following the North Korean model — Seoul is presently held hostage to North Korean guns from across the DMZ — Iran chose to invest in this technology, rather than the tanks and airplanes that have been regularly destroyed by the IDF in previous wars. And all of this is entirely under the control of Teheran. Syria no longer has independent military volition. So Israel has to worry about Syria, about the 40,000 rockets that Hizbullah has received from Iran via Syria under the nose of the UN, about the Hamas forces presently — with Iranian training, funding and supply — being converted from a terrorist militia to a real army, and of course about the soon-to-be operational nuclear capability of Iran herself. Glick did not discuss the question of whether the US invasion of Iraq was a good idea. But she said that given the present situation, any exit from Iraq that leaves Iran in control will certainly tip the balance in the region, allowing Iranian forces to sweep through weak, unstable Jordan and fulfill Ahmadinejad’s dream of ‘liberating’ Jerusalem. Given all this, the ‘peace process’ between Israel and the PA — which doesn’t even represent the Palestinians, who overwhelmingly voted for Hamas — is less than irrelevant, and is a distraction from the real threat to Israel and to the interests of the US. Glick stayed away from US politics. But she did say that the Democratic Party should disassociate itself from Jimmy Carter, who has done real damage to American interests by legitimizing Hamas. Caroline Glick presents what is generally considered a right-wing point of view in Israel. But unlike almost all politicians and most commentators anywhere on the political spectrum, she is both very well-informed and brutally honest. Pay attention to what she says. Do we need to repeat the immortal words of Pogo Possum here? Or is it enough to remind ourselves of the tradition that the Temple was destroyed as a result of inter-Jewish squabbling? The idea that peace can be achieved by means of Israeli concessions represents a misreading of the Palestinian leadership, moderate and extremist alike. The blindness of the Left in Israel, which often seems to view “the Occupation” as far worse than an Israel surrounded by Hamas-dominated terror states in rocket range of population centers and Ben Gurion Airport, and which somehow refuses to believe — despite their words and deeds — that the Palestinians don’t want peace as much as Israeli leftists do, is remarkable, even pathological. Americans are seriously misinformed about day-to-day events in the region due to the highly biased American media — at least, those outlets favored by liberals, like NPR, the New York Times, etc. But what really triggered the creation of “J street”, in my opinion, is an issue which Tobin didn’t even mention. We are again hearing calls to appease the enemies of Israel. Once again those who would appease seek to do so at the expense of Israel. They tell us that if we want the Sunnis and the Shiites to stop massacring each other in Iraq then Israel must give up land. They tell us that if we want the Syrians to stop murdering the leaders in Lebanon, then Israel must give up land. They tell us if we want the Saudis to permit women to drive and to vote, Israel must give up land. If we want the sun to rise it the east and set in the west, Israel must give up land. Let me be clear; Israel is not the problem here. Scapegoating Israel will not solve the problem; the problem is the Arab rejection of Israel’s right to exist. But far worse, from the point of view of American Jewish liberals, are Hagee’s domestic policies: against gay marriage, against abortion rights, against (in their opinion) the separation of church and state, etc. Dr. Hagee represents everything that American liberals hate and fear, and in many cases it is close to home — which Israel is not. Here in Central California where evangelical Christianity has many adherents, some Jewish liberals have chosen to make an alliance with Muslim groups to oppose what they see as the threat of Christian proselytizing in schools. The fact that these Muslims also present anti-Israel views is not as important to them as the local issue. In fact, if you believe sources like Jews on First, the greatest threat facing Jewry in the 21st Century is evangelical Christianity, not radical Islam! History will decide whether AIPAC made the right decision in regard to the Christian Right. But there is no question that uppermost in their minds was what would be best for Israel and its relationship with the US in the long run, and not whether left-wing American Jews, whose support for Israel has recently been lukewarm at best, would be unhappy. Had the UN been ‘in the picture’, the result would have been that the regime that is the Mideast’s greatest terrorist hotel, whose mischief in the region — done for its own purposes and Iran’s — is unparalleled in recent history, would soon have the material to build a nuclear or radiological weapon. Israel’s bombing the reactor may have saved countless lives, while ElBaradei’s activities have done no more than provide a cover for Iran to move its own nuclear program forward. “[T]he director general views the unilateral use of force by Israel as undermining the due process of verification that is at the heart of the nonproliferation regime”, said the UN agency. Actually, the unilateral use of force was the safest and most effective way to deal with the threat, and — like the Israeli attack on the Iraqi reactor in 1981 — was doubtless quietly appreciated in foreign ministries around the world. But the question of Iran’s nuclear development is more complicated. If the major powers, including the US, have decided that the better part of valor will be to accept Iran as a nuclear power, then the stage is set for a confrontation between Israel and Iran. But it would be of an entirely different character than a unilateral surgical strike; it would involve widespread destruction and loss of life on both sides. Such an outcome is still preventable; but if it is allowed to happen it wouldn’t be the first time that the cowardice of the Western democracies and the narrow self-interest of the Russians has given birth to a catastrophe of historic proportions.